Why the red unicycle was left in the Seward, Alaska, dump and what inspired George Peck’s wife, Carol, to bring it home are both unclear. “I’m a salvager and recycler,” is all she will say. “She’s a dump rat,” Peck says. Carol put the unicycle in the garage, and Peck found it there. This was almost fourteen years ago. His life hasn’t been the same since. “I glom on to things,” Peck says. “He gets obsessed,” Carol says. 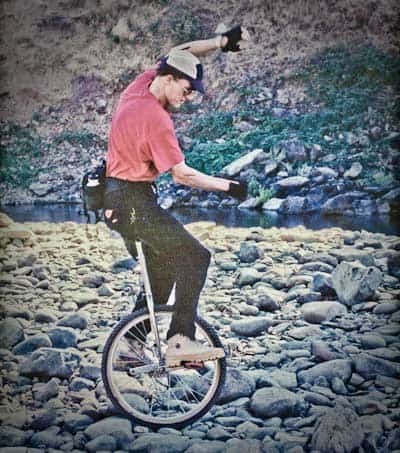 Peck taught himself to ride the red unicycle — no books, no instructors. He practiced daily for more than a month before he could wobble up and down his driveway. Then he attempted to take the unicycle onto the roads. Riding a unicycle is as precarious as it looks — the “cone of balance,” as Peck calls it, is extraordinarily precise. A pebble can be enough to put you on your back. So can a patch of sand or a gust of wind or a crack in the pavement. This may be why the red cycle was tossed into the dump: Seward is possibly the worst spot on the planet in which to ride a unicycle. The place is all sand and gusts and cracks, not to mention ice and snow and logs and boulders and mountains.